It�s irreverent... it�s edgy... it�s a wise-cracking "war of words" where your card deck gives you the ammunition for round after round of verbal sparring. It�s "The Dozens"! 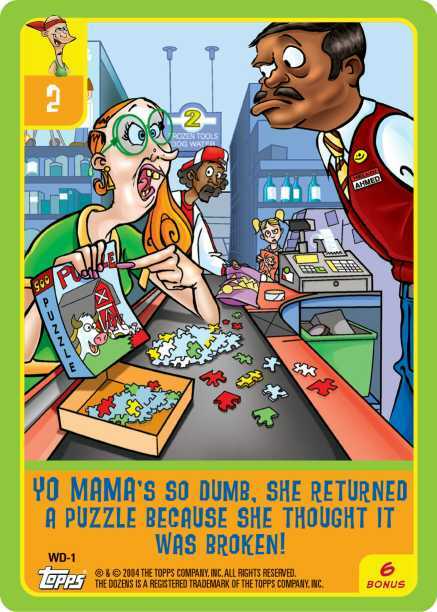 The rank-out game of trading "Yo Mama" jokes is now a collectible card game. "Keenen, Shawn and I want others to be able enjoy today the laughter and good times we had when we were growing up," said Marlon Wayans. 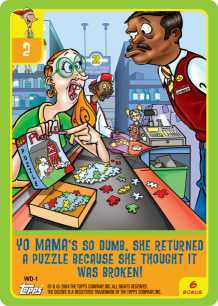 The game features 150 different joke cards such as "Yo mama�s so dumb, she sold her car for gas money!" and "Yo mama�s so skinny, the animals at the zoo feed her!" with power rankings from 1 to 12. Challengers can compete by trying to outrank each other on their own or by having an audience decide which insults are the funniest. "The Dozens" is available in foil packs, each containing 5 joke cards, one sticker, game rules and a piece of bubble gum. From June 1st to July 31st, "The Dozens" will be available exclusively throughout the BLOCKBUSTER video chain. In August, distribution will go nation-wide including major retail outlets, convenience stores, specialty chains and hobby shops. Topps has also teamed with Bonus Mobile Entertainment on a cellular phone version of the card game. "There's nothing in the market that�s anything like 'The Dozens'," said Ira Friedman, Topps VP/Publishing. "Urban and suburban America is in for a whole lot of fun." The Topps Company (www.topps.com) founded in l938 as Topps Chewing Gum, is an international marketer of kids� entertainment products encompassing trading cards, confections, sticker album collections and games. Brands within the Company's portfolio include: Wacky Packages, Garbage Pail Kids, Topps Baseball Cards and Bazooka Bubble Gum.